The tools and materials required: clockwise from left, two pieces of 2" wide pine stock perfectly squared around, mortising gauge, mallet, marking knife, crosscut and rip backsaws, pair of bench hooks, paring chisel, primary mortising chisel, narrow mortising chisel, chisel-pointed pencil, and square. 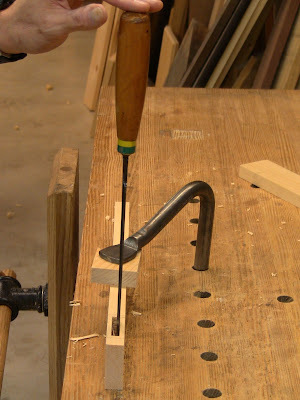 In Four-Stroke Tenoning Exercise, I said that the method could be applied to mortises as well. Here it is, in obsessive detail. 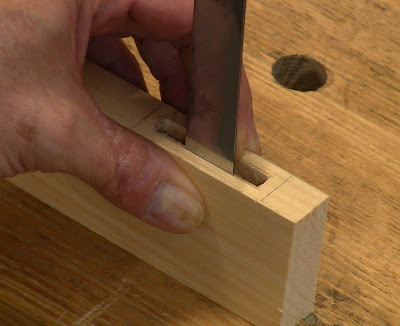 Chop it out with a chisel (bench or mortise chisel of various styles). Drill the bulk of the waste out, then pare to the lines. I generally prefer to chop it with a chisel, for no reason other than personal preference. But just as expecting a tenon to fit right off the saw is challenging for a beginner, so is getting a good mortise right off the chisel. The main difficulty I've observed is keeping the chisel straight vertically when pounding on it with a mallet, and keeping it from twisting. It doesn't take much error at all to end up with a meandering mortise edge down its length, with various bulges and hollows in its walls. What should be flat planar walls end up pretty bumpy. 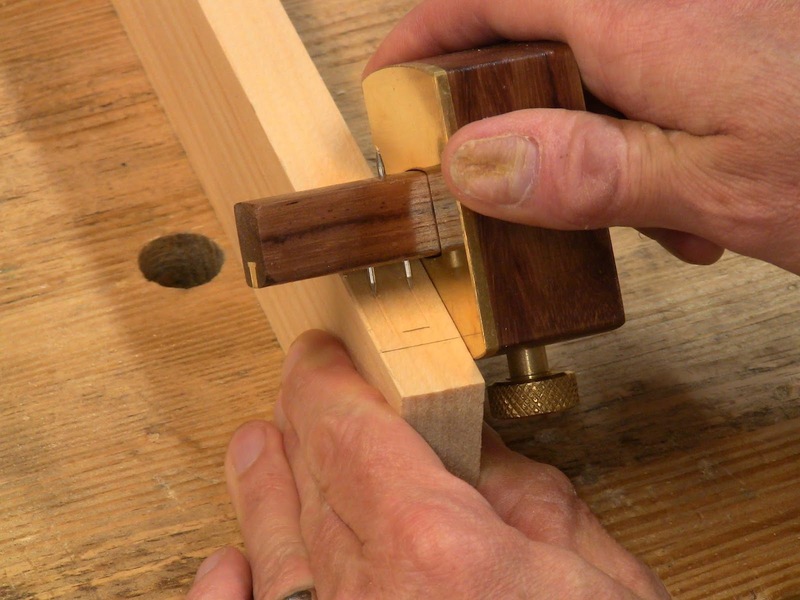 This makes it difficult to get a snug fit, and imparts twist or misalignment to the tenon when inserted. 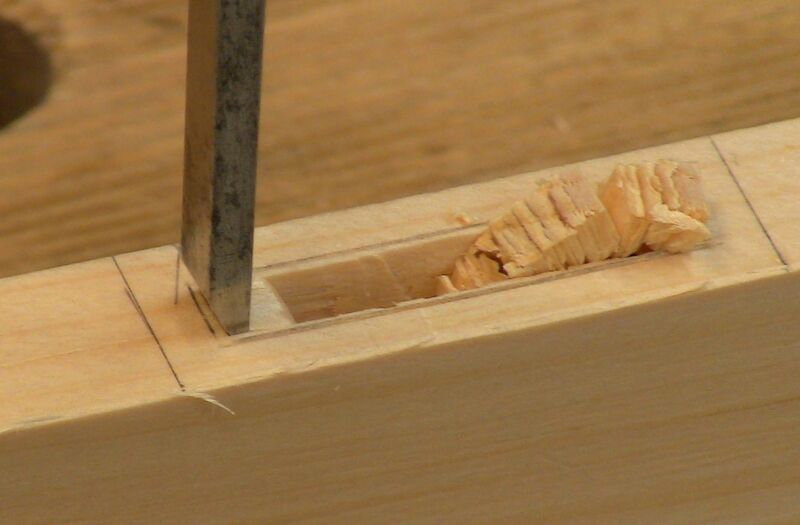 The advice I'm familiar with is never to attempt to improve a mortise other than cleaning up obvious protrusions, because pretty much anything you do will end up widening it. 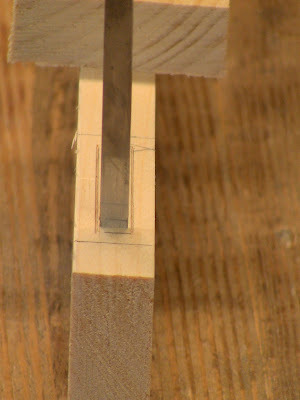 Then the tenon that was gauged to the same chisel width as the mortise will be too loose. As I was working out the four-stroke exercise, I had an epiphany. Why not combine the expected paring of the drilled mortise with the chiseled method? 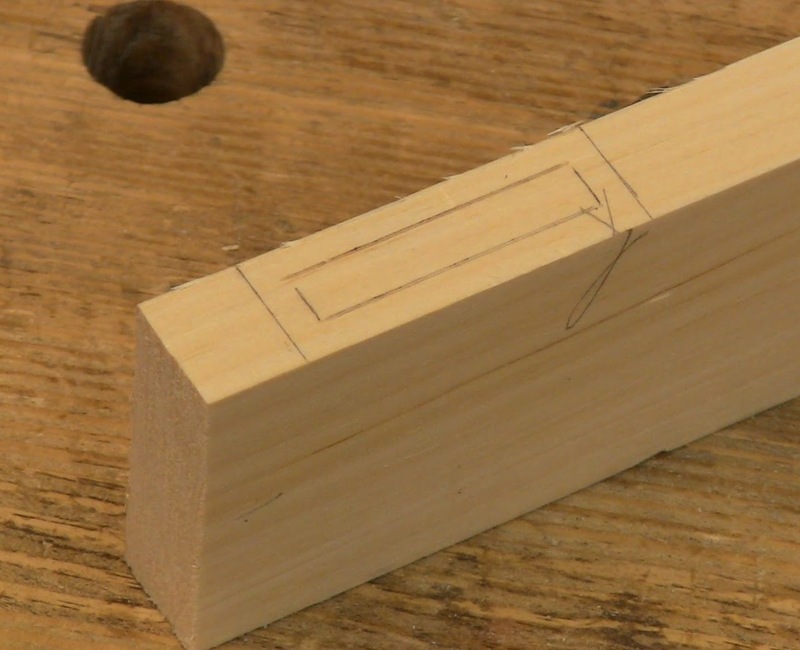 Plan on paring, and adjust the tenon width beforehand with that expectation. I can hear the howls of outrage now! That's not the way you should do it! That's just wrong! But bear with me here. 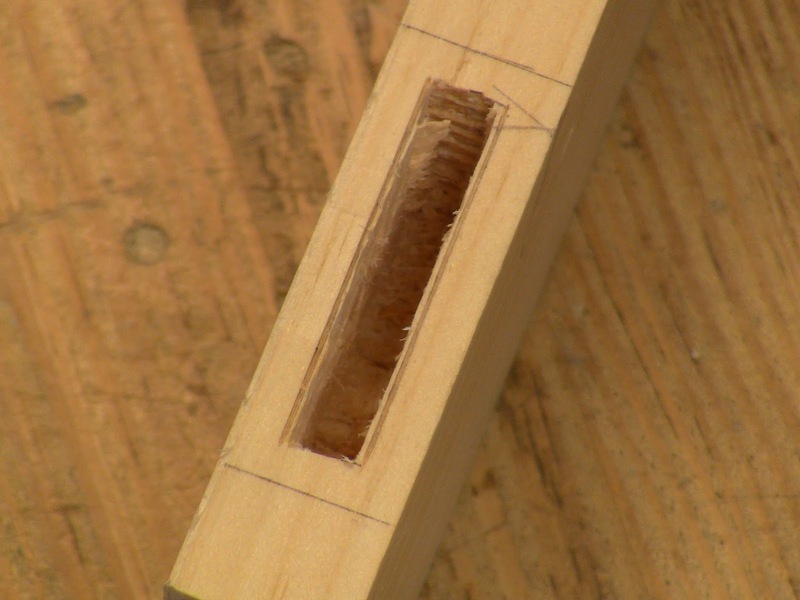 You can apply the four-stroke method to the mortise walls and get the same quality results it gives with the tenon. You just need to coordinate the two. 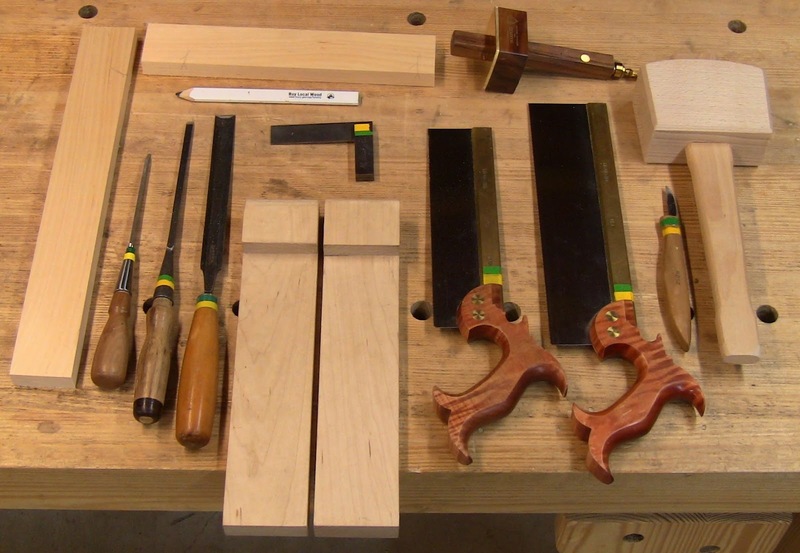 The other good news is that every step here improves your skill with saw and chisel, and you are practicing the traditional straight-from-the-saw tenon and straight-from-the-chisel mortise even as you add the paring steps. Eventually you may decide to eliminate the paring because your saw and chisel skills have eliminated the need for them. I also wouldn't be surprised to learn that this is a common method somewhere. People have been doing this for centuries, so I'm probably not the first person to come up with this bright idea. 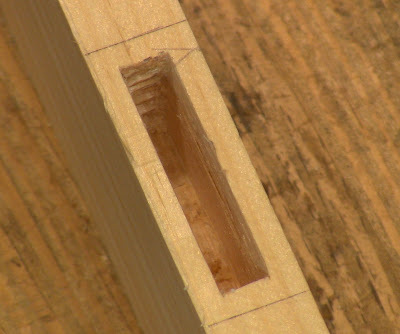 Mortise and tenon joints are commonly used to join the corners of frames, such as for frame-and-panel doors. The crosspieces are the rails, and the uprights are the stiles. The typical configuration is that the tenons are made in the rails, and the mortises are made in the stiles. That's how I'll refer to the parts here. Make sure the stock you're working with is perfectly square around. The ends need to be reasonably square, but not perfect. Mark reference face and edge on each. You will work both rail and stile pieces with face sides up. That's how you know if you have one of the pieces upside down. Always check your marks to verify that both reference faces are facing the same way. Layout the width of the rail (the tenon piece) on the end of the stile (the mortise piece). Leave about a half-inch of extra length on the stile. 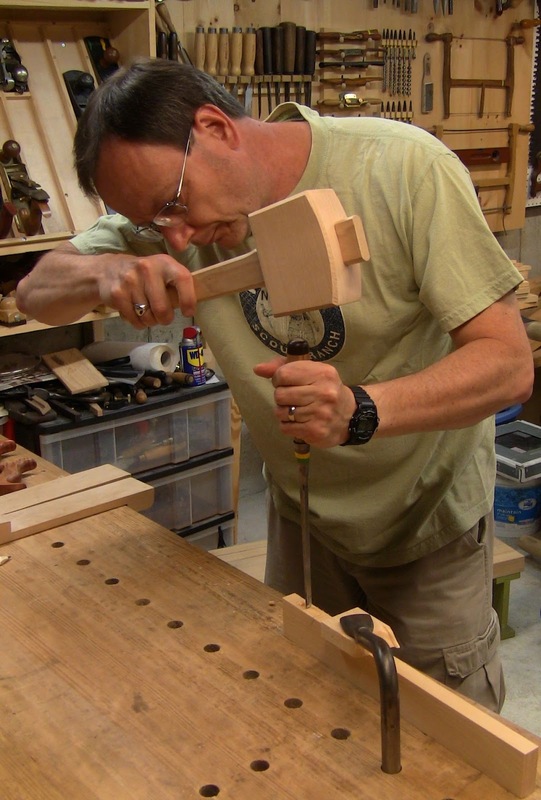 This is called the horn; it provides extra wood to maintain strength to avoid splitting or blowing out the end grain when chopping the mortise. You saw it off and plane it flush after the joint is glued up. Mark the length of the mortise in between the rail width marks, about 1/8" to 1/4" in. Stile (mortise piece) on the left, rail (tenon piece) on the right. The face side is up on both pieces. The edge of the stile is marked for the rail width and mortise length inside that width. The mark corresponding to the right edge of the rail is about a half inch down, leaving a temporary horn for strength. 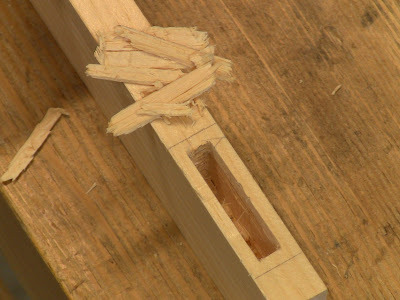 The mortise ends are marked inside the rail edge lines. The trick to all this is in the setting of the mortise gauge. 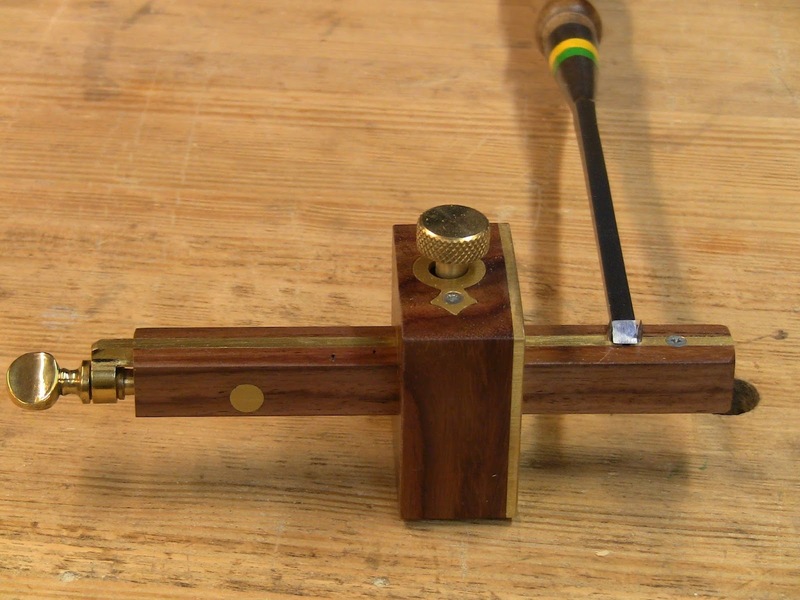 This is a marking gauge with two pins that can be adjusted for width. 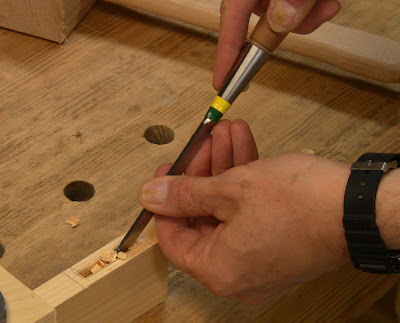 Normally you set the width of the pins by setting your mortise chisel on them and adjusting them so that their tips are the width of the chisel. 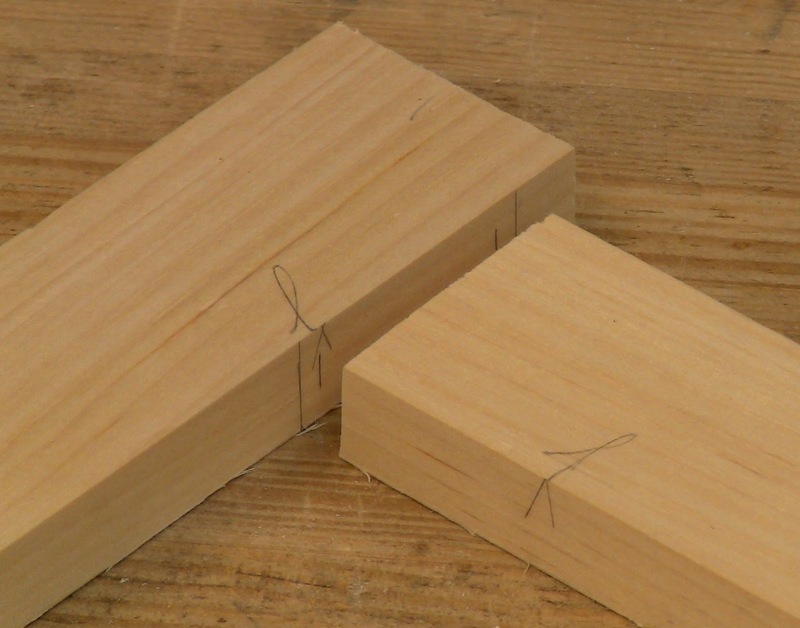 Instead, drop the chisel between them so that the their sides are the width of the chisel. This offsets the tips, which do the actual marking, by about 1/32". That's it. You've just compensated for the paring you plan to do. 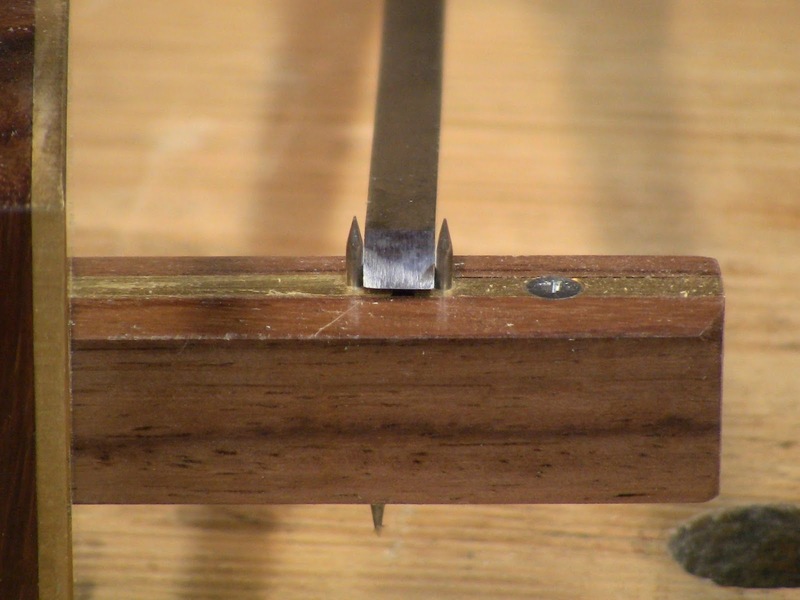 If you have a different type of mortise gauge, one with wheels or knives, you simply have to set the extra gauge width by hand. The only consequence of this is that it affects the size of chisel you use. The width of a mortise should be between 1/3 and 1/2 the thickness of the stock. Less than 1/3, and you'll have beefy mortise walls but the tenon will be weak. More than 1/2, and tenon will be beefy but the mortise walls will be weak. You still need to follow these guidelines, but now you have an extra 1/16" of width to factor in. So your 1/4" chisel that was a perfect third of 3/4" stock will no longer produce a mortise exactly 1/3 the thickness. However, it's still within the 1/2 requirement. The problem is if you were planning on using a 3/8" chisel; that plus the extra width would be too much. 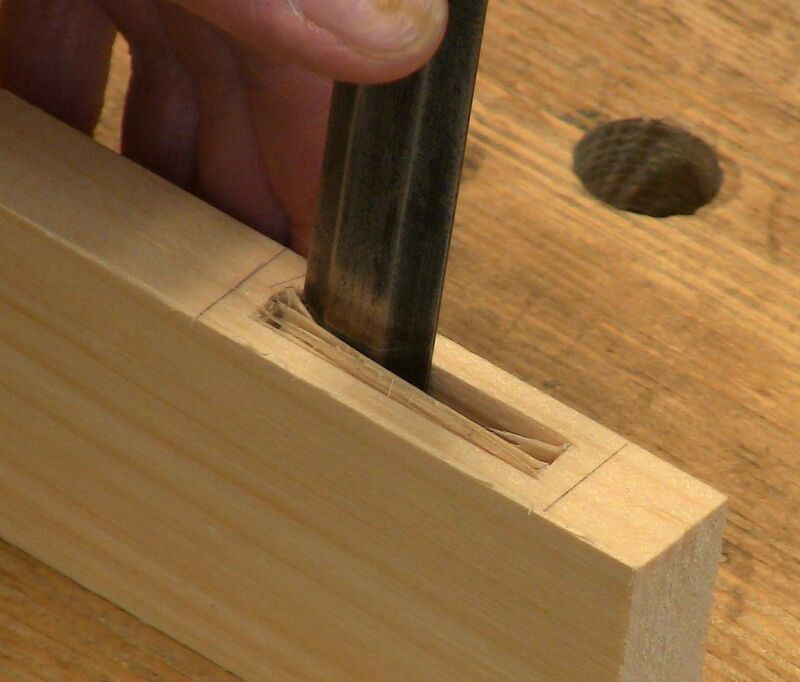 Conversely, if you need the mortise to be a specific width, such as a 1/4" mortise that matches up with a 1/4" groove to accept the panel in a frame-and-panel door, you'll need to use a narrower primary mortise chisel. 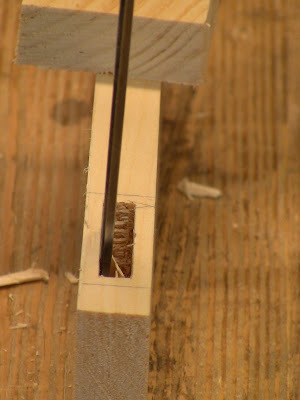 Set the pins of the mortise gauge to the width of the chisel. 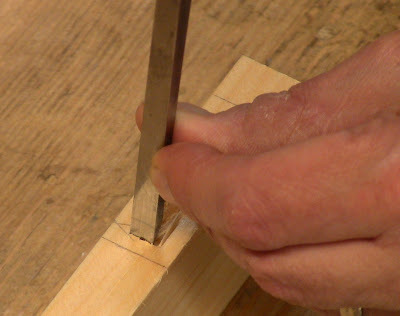 Here I'm using a 1/4" mortise chisel. Closeup: that means drop the chisel all the way down between them. Adjust the body of the gauge until the pins are reasonably centered on the thickness of the stile when referenced from the face side. Everything here is referenced from the face side, on both rail and stile, so double check that every time you apply the gauge to a piece. That way, if the mortise is slightly offset from center, the tenon will be correspondingly offset; but if you turn one or the other upside down, the offset will be on the wrong side. Press the face of the gauge against the face side of the stile, tip it so the pins trail, and mark the mortise width between the end marks. Mark using repeated light passes; too heavy a pass tends to get caught in the grain. Run the chisel point of the pencil down the lines to make them more visible. Trail the pins as you push the gauge between the end marks. You can also do it the opposite way, tip the gauge toward you and pull it from the far mark. But keep the body firmly pressed against the face side of the stile. 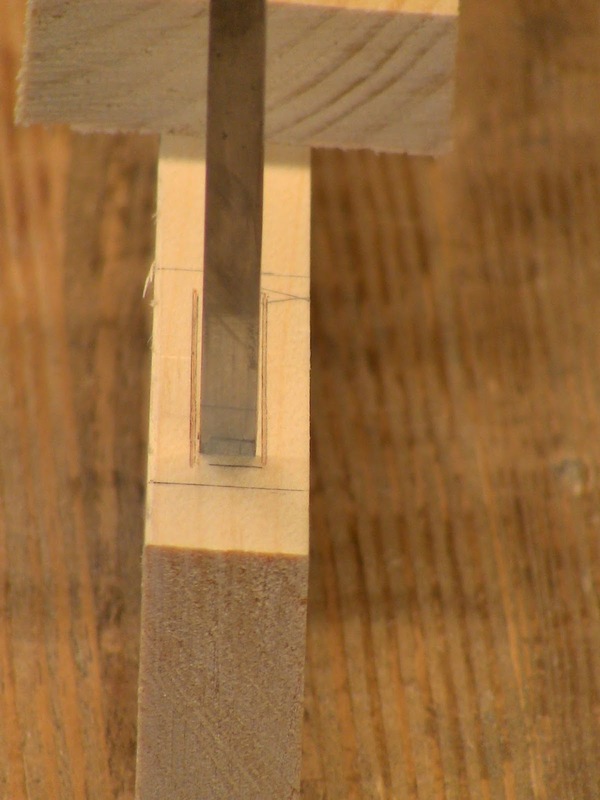 You can mark the tenon now, but I'm going to save it for later once we know the actual depth of the mortise. So keep the gauge around, don't lose its setting. 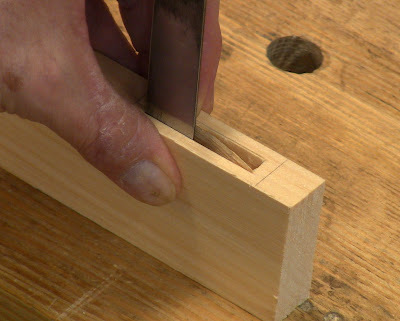 But you can certainly layout the tenon for a specific mortise depth, and make sure the mortise is that depth. I'm not paying a whole of attention to absolute numerical measurements here. Other than the extra width, this mortise follows the traditional pattern. Specifically, I'm following Paul Sellers' chopping method. Most other authors describe a similar method, but with some variation in the fine details (or annoyingly, they omit the fine details!). Note that I'm doing a blind mortise here, the simplest type, not a through mortise. But a through mortise is essentially two blind mortises started from opposite sides that meet in the middle. 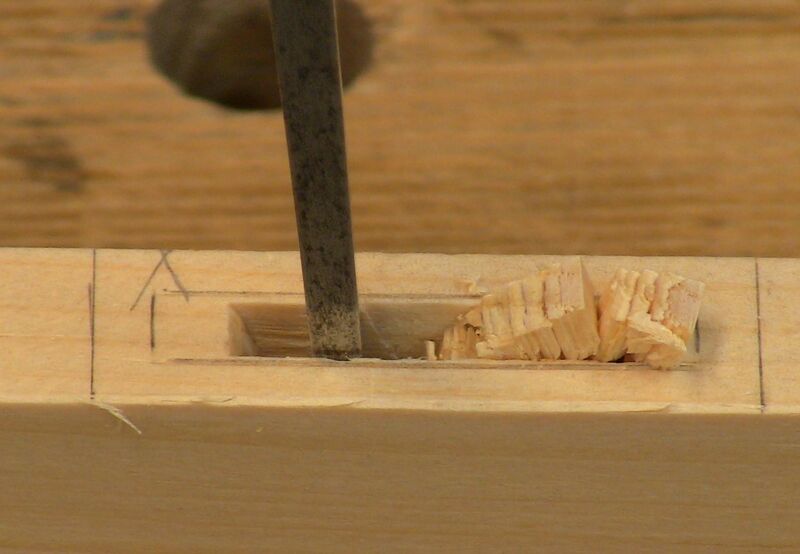 That requires more formal layout of the mortise ends, since they need to be transferred around the piece from the first side to the second to ensure alignment. 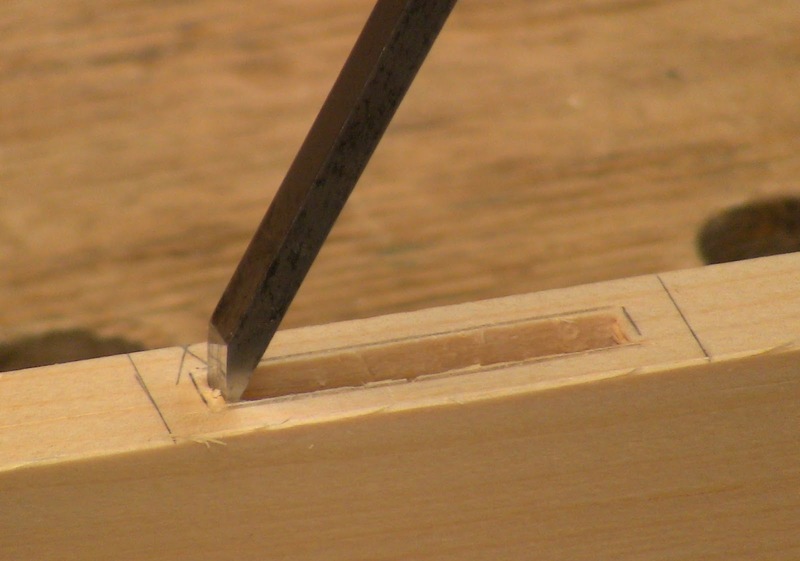 Start the mortise chisel about 1/16" to 1/8" from one end of the mortise, holding it dead vertical, centered between the gauge lines. The key thing is to have the bevel facing away from that end, facing the direction of travel down the length of the mortise. I like to stand at the end and sight down the length of the stile so I can watch the chisel alignment side to side and make sure it stays vertical. The angle forward and back is less critical at this stage. I start the chisel at the near end of the mortise, with the bevel facing the far end. Standing at the end of the stile and sighting down the chisel from the back side to maintain alignment as I strike with the mallet. Make the first cut with the chisel very lightly, about 1/16" deep. 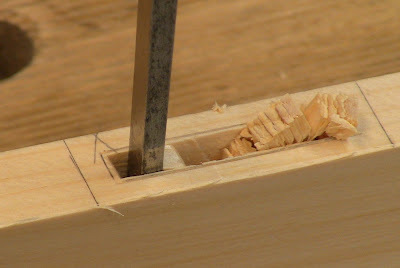 Then advance the chisel about 1/8" and drive it a little deeper with the mallet. 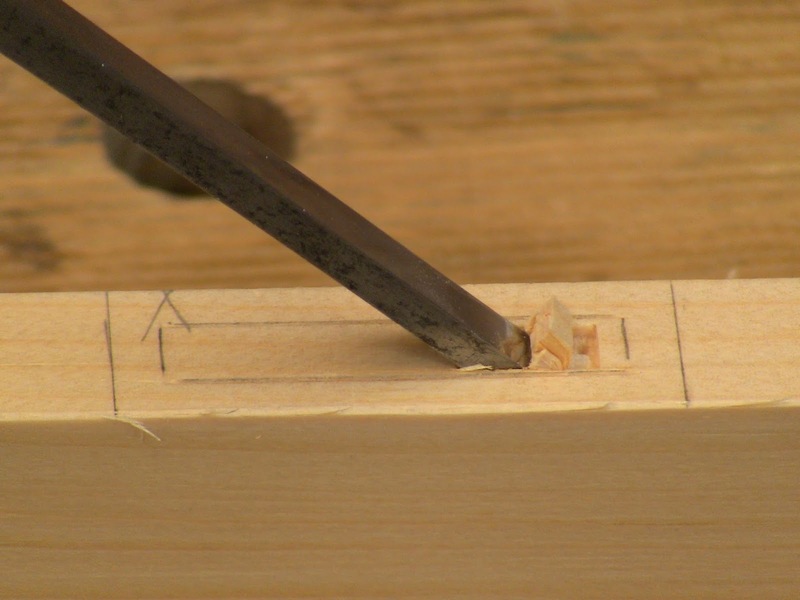 For each step forward, you can drive the chisel deeper, to that same depth; by the time you've progressed 1" down the length of the mortise, the chisel should be going in about 1" deep. You'll notice that the wedging action of the bevel on the forward side pushes the chisel back into the previously cut wood, starting to break it out. Meanwhile the end grain wood ahead of the chisel will by cut at the bevel angle. Lever the chisel forward as you go to pry out the waste. Proceed this way progressively deeper until you reach 1/16" from the far end. Pay attention to the total depth so you don't go too deep. Start the chisel 1/16" from the near end, bevel facing the far end. With the chisel standing vertically, sight down chisel and stile from behind so that it is aligned with the gauge lines and edges of the stile. Closeup of the chisel centered between the gauge lines and visually aligned with them as it stands vertically. 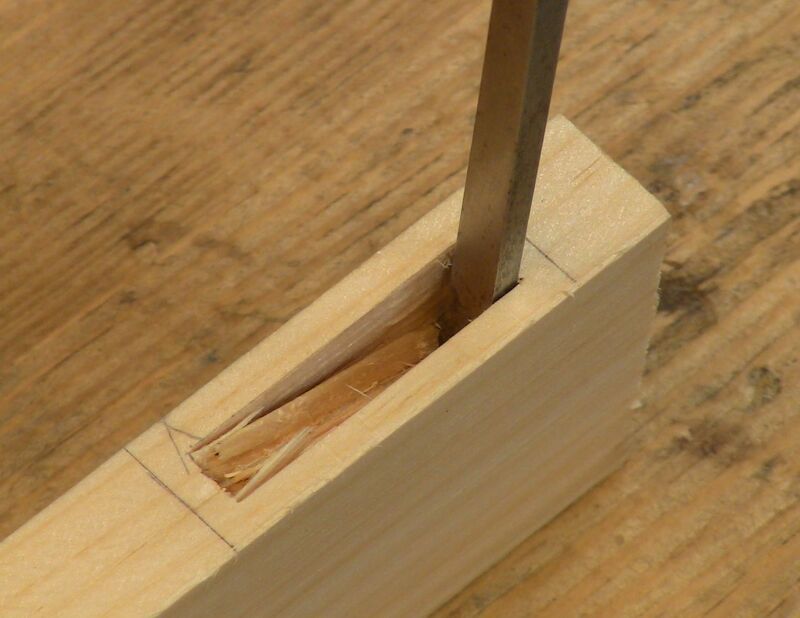 After two steps forward down the length of the mortise, levering the chisel forward to pry out the waste and flick it aside. Removing as much waste as you can while you go makes it easier to clean out. Getting pretty deep! Now the chisel is sliding down the far slope along its bevel a significant distance as it cuts. Last chop at the far end, about 1/16" from the line. I got a little too close with this one. 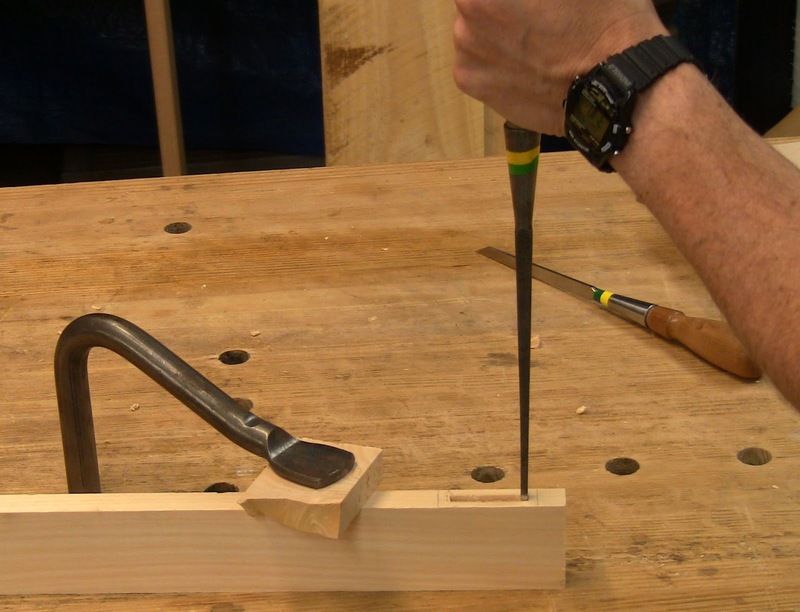 The chisel slides down backwards on its bevel, leaving a sloped end. At this point, the mortise will be an inverted triangle in the wood, stepped in increments on the near slope, and cut smoothly on the far slope. This is where the narrow mortise chisel comes in. Push it down the near slope bevel up, cutting down the steps. Its narrower width allows it to fit in easily, and its narrow edge concentrates the cutting force. Clean out as much loose waste as you can; it tends to get packed in. Push the narrow chisel down the slope bevel up to clear it out. Inside the mortise, with smooth far slope and choppy near slope. 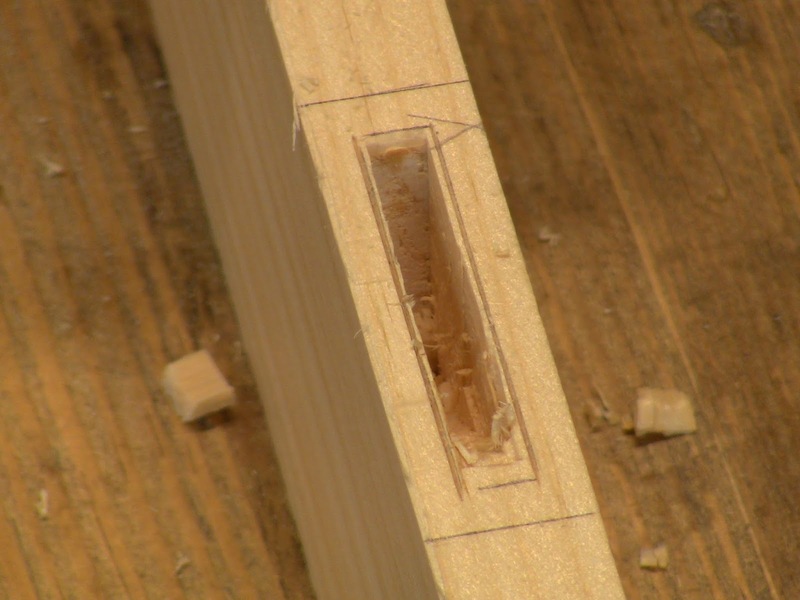 To finish off the mortise, come backward from the far end. Start by angling the chisel back at the bevel angle, so the bevel rides straight down as you strike the handle with the mallet. From there, simply spin the chisel around, so the bevel faces the near end, and chop the return path the same way as the outgoing path. 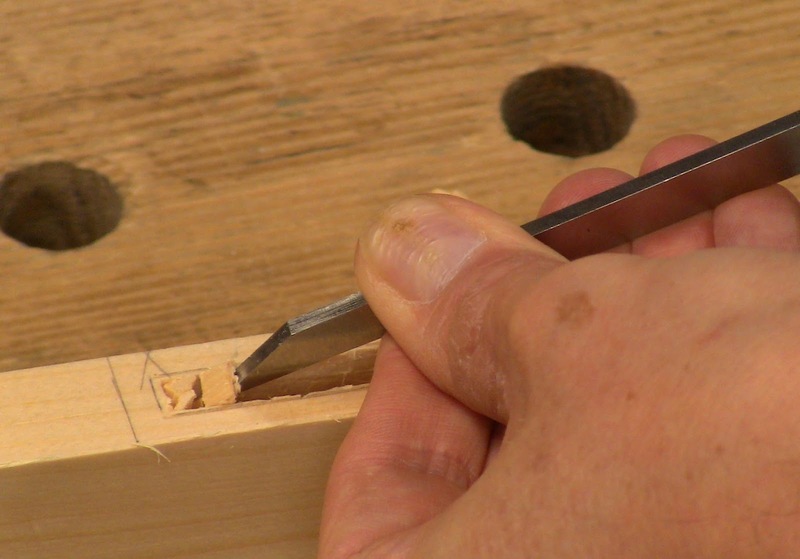 Because there's little or no wood behind the chisel now to resist it, you'll notice it slides backward and deep quickly. Clean it out again with the narrow chisel. If necessary, make another series of cuts to go deeper. 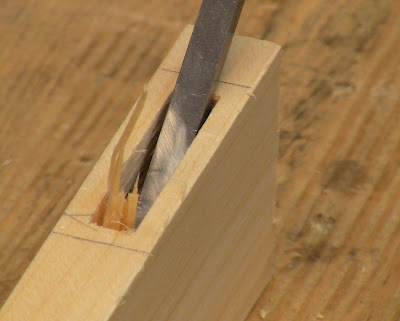 The narrow chisel is useful for this as well, since the primary chisel can get jammed up along the walls as the mortise gets deeper. You can use the tip to perforate the floor and break up the fibers, then scrape it back and forth. At the far end, angle the chisel back at the bevel angle, so the bevel is perpendicular to the wood, and chop down. The bevel will ride straight down. Cleaning out the deep junk with the narrow chisel. Now finish off each end. Set the primary mortise chisel on the end line, bevel facing into the mortise. Make sure it is dead vertical both side to side and forward and back. Look along both axes to verify. Once you're sure, chop straight down. It should be easy because there's very little wood to remove. Clean this last bit of waste out. Chop dead straight down the near end with the bevel facing into the mortise. Then spin the chisel around and repeat at the far end. At this point you have a traditionally chopped mortise. If you're getting a good mortise with straight edges and flat walls, maybe you don't need to use the paring method. Otherwise, this makes good practice. 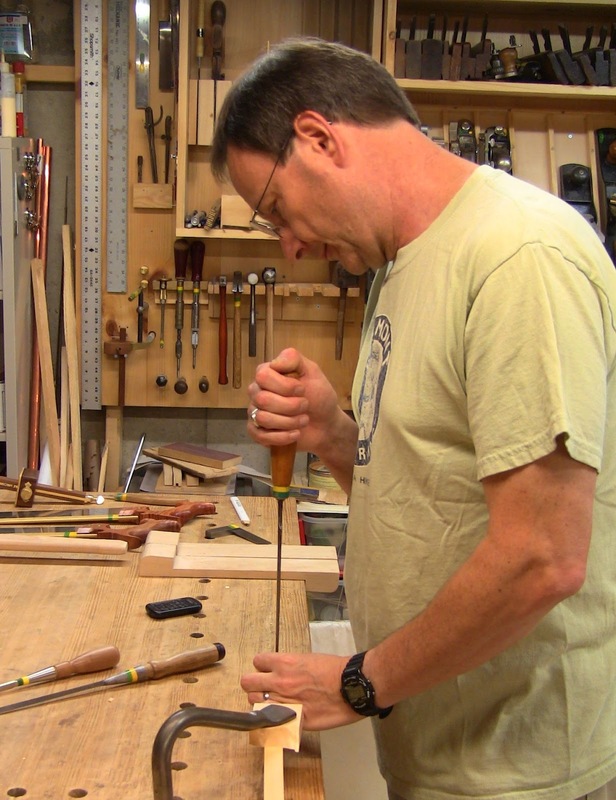 You'll find your initial mortises will get better and better over time. The chopped mortise, ready for paring. This is where we really deviate from the norm. This is what you would do if you had drilled out the waste with a series of holes instead of chopping it. As with the four-stroke exercise, the gauge lines form a recess to drop your chisel into, precisely positioned. That's how that method applies here. 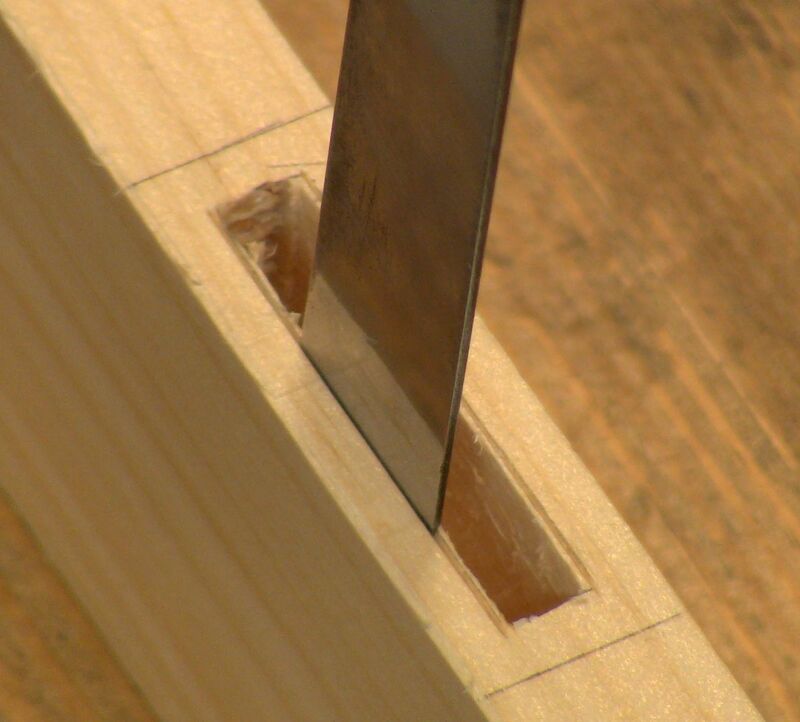 You need to have a razor sharp paring chisel, and pare straight down the mortise walls. It should be easy to pare across the grain because there's only a thin layer. Set the edge of the paring chisel into the center of the gauge line. Sight down the chisel and along its side to make sure it's perfectly vertical. Closeup showing the grip, pinching the chisel to the wall with finger and thumb as you push down. Move over and make the next slice down, then do the other end. Repeat as necessary depending on the chisel width. Spin the chisel around to the opposite wall, again pinching wood and chisel together as you push down. Final stroke. Ok, I think the "four" stroke count has gone astray, but you get the idea. To finish the mortise, chop down the parings in all four corners with the primary mortise chisel and clean them out. 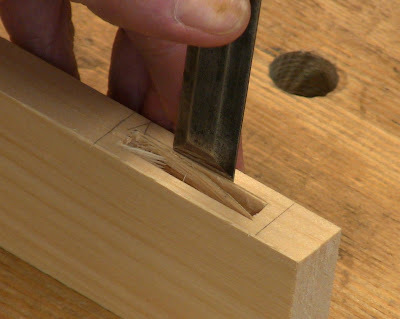 This chisel fits easily now, since the mortise is wider. Chop straight down in each corner to sever the parings at the end of the mortise. Setting up to chop down at the other end. 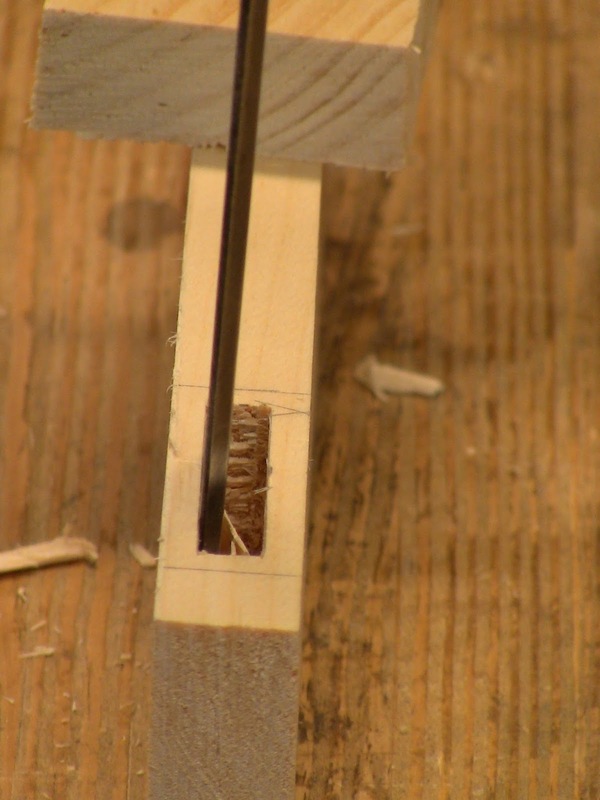 The primary mortise chisel fits into the widened mortise easily now for clean out. That's nice because getting the last bits of junk out is always a nuisance. Turn it upside down and scrape it clean with the chisel. The cleaned out mortise and severed parings. To check the side walls, drop the edge of the paring chisel into the bottom of the mortise with the back flat up against the far wall. Sight down the side to see if it stands up perfectly vertically. Spin the chisel around and check the other side the same way. If the chisel isn't standing vertically, the wall is sloping. If it's sloping inward (narrowing at the bottom), you can carefully pare down a bit in the bottom portion of the side to get it vertical. Just don't remove too much! If it's sloping outward (widening at the bottom), you're in trouble. You can pare the upper parts of the wall, which means you'll need to make the tenon wider...and now you're down the whole problem path we were trying to avoid. So err on the side of walls that slope inward. Set the edge of the chisel in the bottom where it meets the far wall and push the back up against the wall. The chisel should be vertical. Spin the chisel around and check the near wall. I found just a bit of inward slope in the bottom of the mortise on one side, so I pared that down and cleaned it out. The final mortise, ready to accept the tenon. 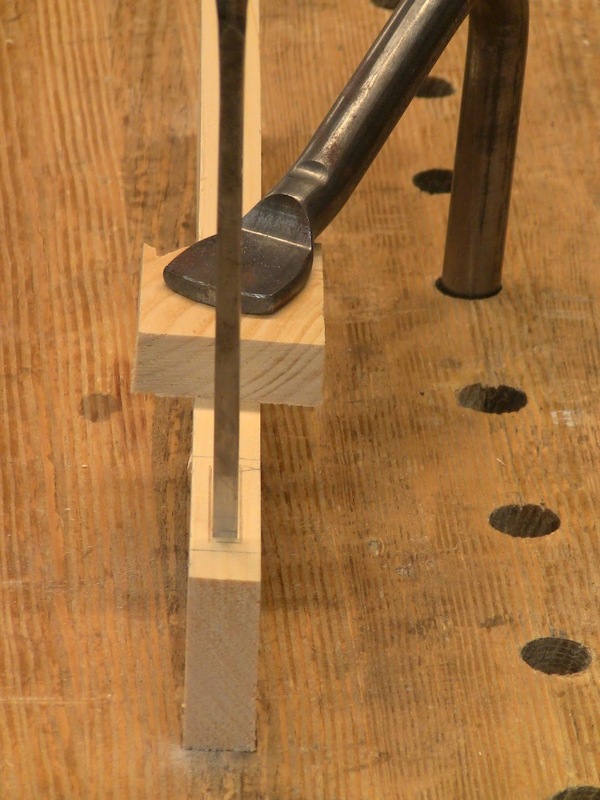 Continue to part 2, where we'll use the four-stroke method to precisely form the tenon.